Last week’s foam adventure left me unsatisfied; though the foam itself was excellent, the total drink was lacking. And in the aftermath of my failure, I knew there was a reliable way to redeem myself. I brought back our old friend, that time-tested combination, pineapple and fernet. I have already spoken at some length about this combination; we all know it’s a winner. What I wanted to do with this drink was to showcase the foam with a simple drink that would support it. In my earlier experiment, I tried to unify two wholly disparate parts into a single drink, with predictable results. Here, rather than putting two drinks in one glass and watching them fight, I envisioned a single drink, and split half of its components into a foam, and the other half into a cocktail. The marriage was perfect; I placed a simple foam on top of a simple drink, and it needed nothing. I admit, I had my reservations about the foam recipe itself. To make a good foam, one needs to a balance the ratio of sugar to acid, not merely for flavor, but also for the structural integrity of the foam. Pineapple juice has a pH of about 3.0, whereas lemon juice hovers between 1.8 and 2.2. I used pineapple juice as the base of this foam, so I knew I needed to use significantly less citrus than in the whiskey sour foam from before, but I wasn’t sure how much less. I ended up taking a stab in the dark, and getting lucky. Pineapple juice also has a high sugar content, so one wonders if it might not be fine on its own. 6 oz Fresh Pineapple Juice, strained. 1 oz Fresh Lime Juice, strained. Combine all in an iSi whipped cream dispenser and discharge two nitrogen cartridges. Allow the canister to rest in the refrigerator for ten minutes before use. 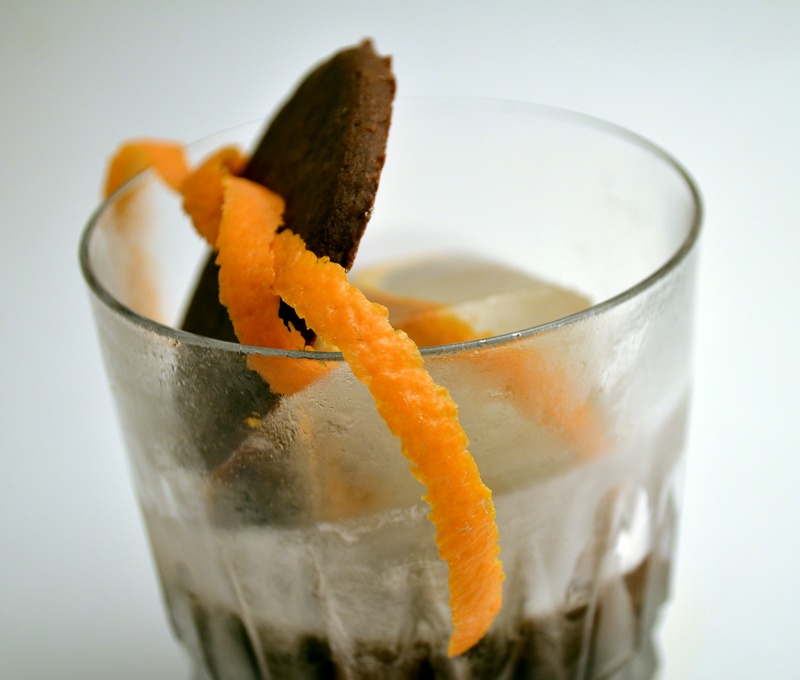 Stir over ice and strain into a rocks glass with a single large ice cube. Top with a generous amount of pineapple foam. This drink needed nothing. Perhaps instead of an old fashioned, it should be called a new fangled, in reference to the molecular mixology technique here employed. Regardless, this was one of my finest original creations to date. The water mellowed out the flavor of the foam, balancing it against the Fernet, allowing the whole drink to breathe. A big danger with foam drinks is that the foam can overwhelm the drink underneath, and dilution of the foam is the secret to keeping the flavors in balance. 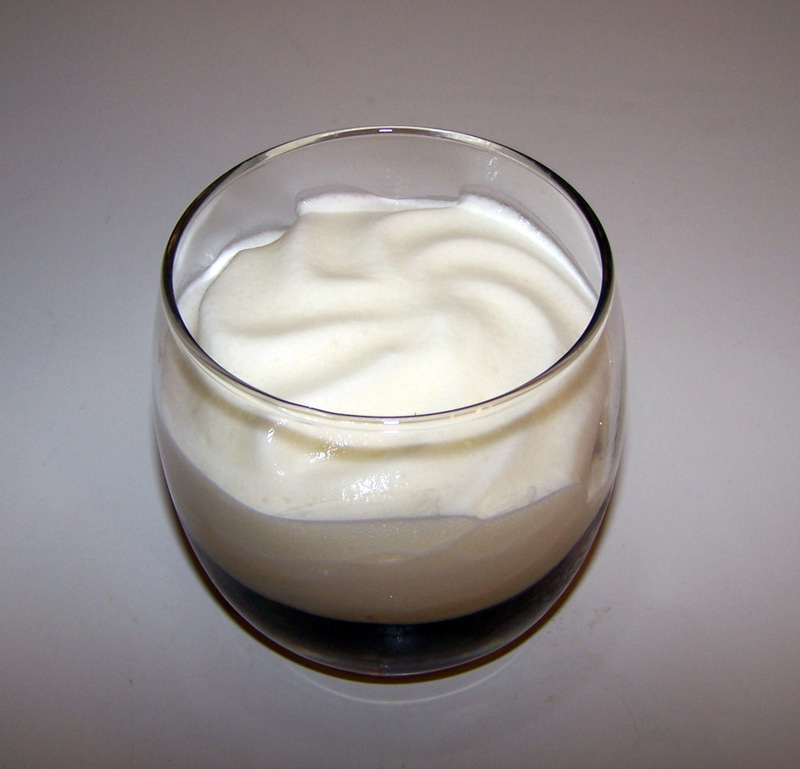 Categories: original creations | Tags: alcohol, angostura, bitters, booze, cocktail, cocktails, drinking, drinks, fernet, foam, isi, mixed drinks, mixology, molecular, molecular mixology, old fashioned, pineapple, pineapple foam, simple syrup, whipped cream dispenser | Permalink. I had the good fortune to pick up a bottle of Angostura 1919 rum and a bottle of Clement Creole Shrub from the new Total Wine that opened up in Bellevue. The 20% + 3.77/liter surcharge on hard liquor in WA state is probably worth it considering that we now have Total Wine and soon, Bevmo. It does raise the price on the bottle of Angostura rum from thirty-six dollars to forty-eight, and that burns, but it’s better than not being able to buy Angostura rum at all. There’s still nowhere to buy Smith and Cross, except maybe the obscenely overpriced Wine and Spirits World in Wallingford. No one outside of Seattle really cares about that, though. On to the reviews! According to the manufacturer, this rum is blended from rums that are aged a minimum of eight years in bourbon casks. I definitely could notice a bourbon quality in the nose, which is full of vanilla, and as I take a sip, I am greeted immediately by honey, which then gives way to tobacco. The strongest flavor in this rum, by far, is the flavor of fresh tobacco, which permeates the swallow and lingers on the finish. It’s very smooth, and distinctively flavored. It might be a bit simple for some palates, but I greatly enjoy when an aged spirit captures one or two flavors very well, as I think you would agree this rum does with the flavor of tobacco. I do not smoke cigars, but if I did, I think this rum would be a perfect accompaniment. If you can get it for thirty-six dollars, it’s a pretty fair price, but fifty is a little much. 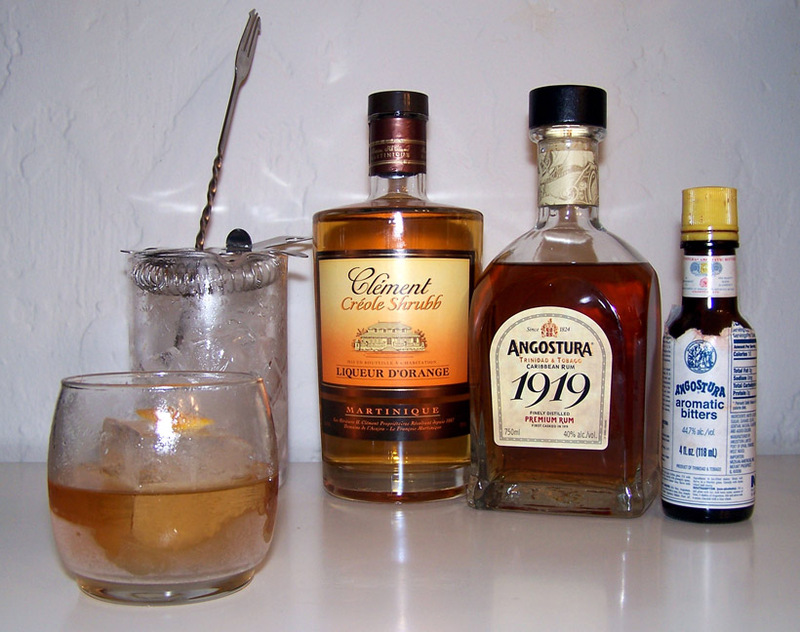 Angostura 1919 is not the first rum I’d buy for my bar, and it’s not the second, but it very well might be the third. (After Smith and Cross or Wray and Nephew, and Zacapa 23) It’s great on ice or in an old fashioned cocktail, but as with most high-end rums, mixing it into a more complicated drink is probably a waste. If you want to go the aromatic route, I suggest mixing it with dry Amontillado sherry and a dash of Angostura bitters, of course. This orange liqueur received extremely good reviews, and I was very eager to try it. Clement Creole Shrubb is the only curaçao liqueur I know that uses Rhum Agricole as the base, as opposed to brandy or a neutral spirit. It’s very similar to Gran Marnier, and it’s probably not worth keeping both in your bar unless you are a very serious curaçao enthusiast, but it’s certainly worth keeping one or the other. I think this liqueur is extremely suited to tiki drinks or any rum-based concoction, because it already has a lot of rum notes from its base spirit. If you sip it neat, it greets you with a very bright orange oil flavor with a sugarcane backend and a little bit of pepper. I like it perhaps a bit more than Gran Marnier for mixing, but not quite as much for sipping neat. It makes a killer Sidecar, Mai Tai, or Daisy, that’s for sure. High quality Curaçao is a must have for your home bar, and this is light years ahead of Gran Gala, which is only fit for removing grease stains from my driveway. Stir over gently over ice and pour over one large ice cube. Garnish with an orange peel. I wanted to experience both of these spirits simultaneously, and of course, they were highly complementary to each other, so I made a fancy Old Fashioned. When using a liqueur such as Maraschino or Curaçao in place of simple syrup it becomes “fancy”, and it should be called as such. When making this substitution in drinks with a large volume of syrup (more than .5 oz), it is generally better to use .5 oz of the liqueur, and simple syrup for the rest, lest you overpower the other flavors in the drink. Categories: spirituality | Tags: 1919, aged rum, angostura, angostura 1919, booze, clement creole shrub, cocktail, cocktails, curacao, drinking, drinks, martinique, mixed drinksb, mixology, old fashioned, rhum agricole, rum | Permalink. 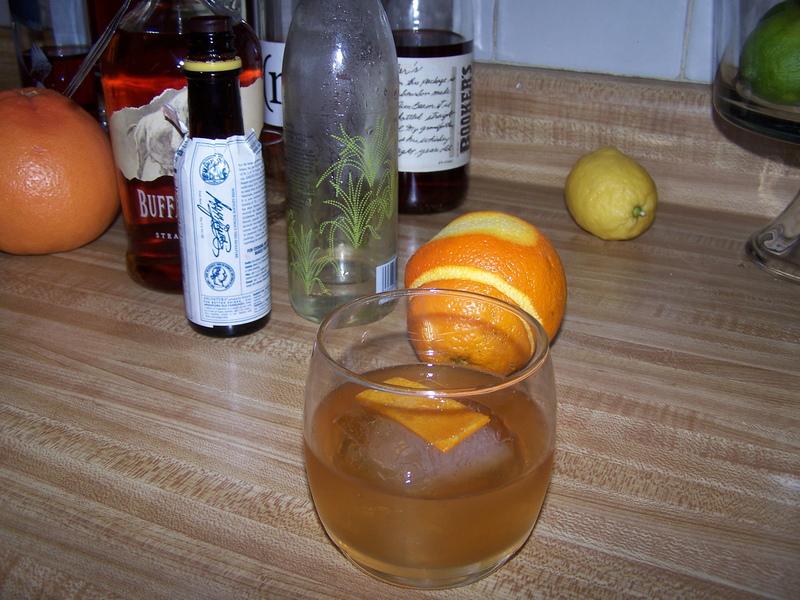 So much has been said about the old fashioned that I will not embarrass myself by trying to describe its history, but I will describe my ideal of how to make one. I often make variants by employing a different base spirit or a flavored syrup. The old fashioned cocktail is a template as much as it is a particular drink, and yet, made with rye, simple syrup, and angostura bitters, it is the perfect platonic ideal of a what a cocktail ought to be. The very first cocktails were little more than bitters and sugar added to a base spirit, and all evolution of modern cocktails has flowed out of such a marriage of flavors. Somehow in the dark ages of drinking, the 60s to the late 90s, the old fashioned was twisted and perverted into a drink with a pulverized fake maraschino cherry, and a smashed up orange and sometimes, god forbid, a drink topped with club soda or–almost unthinkable–sprite. But this marvel has returned to us, probably in large part because of the show Mad Men. You’ll never be Don Draper, but even so, holding an old fashioned will add 25% to the classiness of any outfit. Cut a fat piece of orange peel, and then trim it with a knife into a perfect rectangle. Make sure not to leave any pith on the peel. Place it in the bottom of the glass, and pour the simple syrup on top. Using a muddler, carefully smash the orange peel, just enough to squeeze out its oils. Add the bitters and the whiskey, and then pour the drink into a tumbler filled with ice. Stir, and then pour the drink back into the old fashioned glass, over ice. To make the drink look perfect, a single large ice cube is best. You can make your own at home with this tovolo ice cube tray. There are those who will build the old fashioned in the glass, but neglect to stir it. This results in an inferior drink, because it will not reach the necessary temperature, nor will it reach the appropriate dilution. A counter-intuitive aspect of making excellent drinks: slightly more dilution can result in a more intense flavor, as an overly strong alcohol burn can numb and overpower the palate. 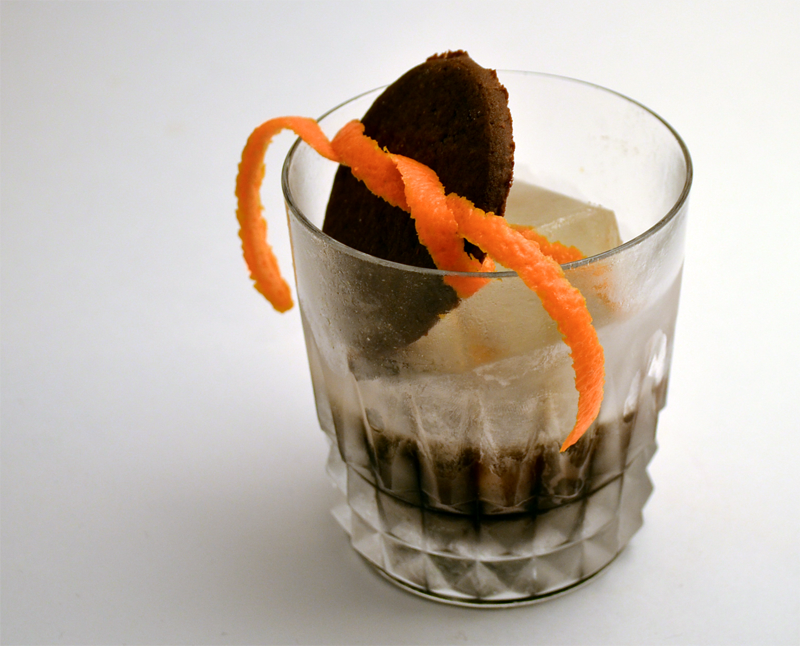 Some will make this drink with a sugar cube instead of simple syrup, and they will use the bitters to break down the cube. Such a method is more laborious, and its only advantage over syrup is slight; the granulated sugar will help to macerate the orange peel, and will produce a superior experience of orange oil. I confess I do not usually trouble myself with this, but I appreciate the ritual. Coming soon: old fashioned cocktail variants. Categories: classics | Tags: booze, bourbon, cocktail, cocktails, drink, drinking, drinks, mad men, old fashioned, old fashioned cocktail, simple syrup, whiskey, whisky | Permalink.